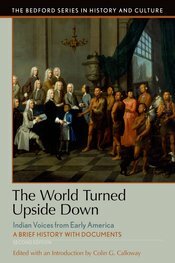 Through a collection of speeches, letters, and primary accounts, and with a revised introduction that draws on an outpouring of scholarship over the past twenty years, Colin Calloway provides insight into the underrepresented Native American voices of the colonial, Revolutionary, and early national periods. With four new text documents and four new visual source documents, the volume continues to portray such themes as loss of land, war and peace, missionaries and Christianity, the education of Native American youth, European technology, European alcohol, and political changes within Indian societies in Early America. Revised Questions for Consideration and an updated Selected Bibliography, along with a new Chronology of Encounters between Indians and Colonists, serve to further support student learning.